In 1958 Guy Burgess, the British spy exiled in Moscow, encounters the actress, Coral Browne, on tour from the "old country". Invited to lunch at Burgess's shabby apartment, she is presented with a strange request. In 1958, the actress Coral Browne met the notorious spy Guy Burgess in Moscow, and was invited to lunch the next day. Alan Bennett was so fascinated by this anecdote that he adapted it twice, for the BBC in 1983 and for the stage five years later. In the TV version, Browne played herself, with Alan Bates as Burgess . Parts were fictionalised, but the substance is largely accurate - and while, for obvious reasons, filming in the USSR was impossible, director John Schlesinger and his team turned wintry Dundee into a surprisingly convincing Moscow. Although now largely forgotten, except as a vaguely-remembered "Burgess & Maclean" double-act, in 1958 an encounter with Burgess would have been hugely newsworthy, since it was only a few years since he and fellow Cambridge-educated diplomat Donald Maclean defected to the Soviet Union, causing an international scandal. But the Burgess of Bennett and Bates is very different from the ruthless traitor of legend. 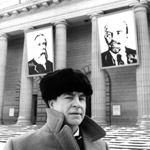 A gloomy, introspective man, clearly disappointed that the grim reality of Soviet Moscow fails to match his Marxist ideals, he laments that it matches the worst features of English life (conformity, bureaucracy, dullness) while shunning the best (wit, irony, gossip), and is equally forlorn to hear that his celebrity status back "in the old country" is already fading. Typically, Bennett stages much of this as wry light comedy - though, equally typically, this conceals some steel-tipped barbs. Appropriately enough, Browne herself is Australian, which gives her an outsider's view of both the English and "the comrades", and enables her to draw telling parallels between the two. The foppish, superficial British Embassy duo ("Oh, do stay to lunch - there'll be jokes!") sketch the world that Burgess abandoned, while discretion reigns supreme on both sides of the Iron Curtain, whether it be the wordless supply of sink plugs or the refusal to even twitch an eyebrow at the notion of supplying clothes to an infamous traitor. As the title suggests, Bennett was more interested in the notion of Burgess as exile than Burgess as traitor. The country he betrayed remains his first love - not only is he still very much an Englishman (he barely speaks Russian), he enlists Browne 's help in further exaggerating his native traits, embodied to perfection in the final shot. There is something strangely triumphant about this unmistakably English gentleman surrounded by identically fur-hatted Russians - even though the image emphasises his alienation from both societies.